Ferns come in a diverse range of texture, color, sizes and and shapes. Their ease of care and diversity of attributes make them an essential part of any well rounded garden. In their native environment, most hardy ferns thrive in the dappled shade of the woodlands and forests, growing in rotted leaves and other natural compost. 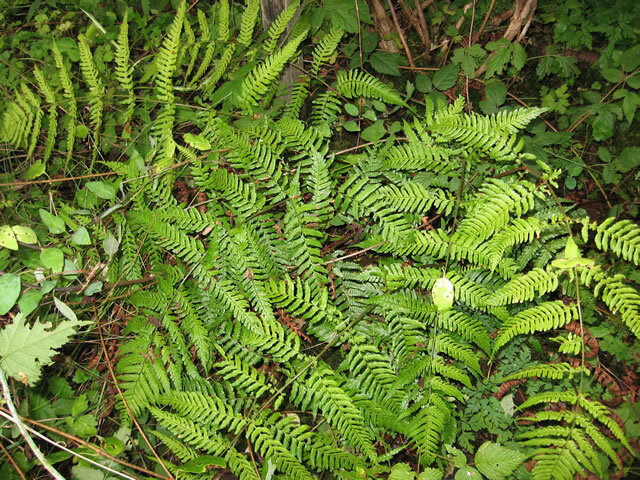 Deciduous ferns should be trimmed as the fronds yellow in late fall and early winter. just before the new fronds emerge. At the same time, apply a new layer of mulch for the new growing year. 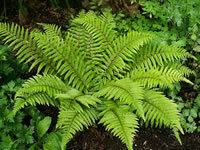 The best time to plant hardy ferns is during the spring and fall when the rain is plentiful. Cultivate the soil thoroughly, adding a good portion of compost into the planting hole before you plant your fern. Ferns are shallow rooted plants and should be planted with their crown flush with the surrounding soil. Keep garden debris away from the crown of your ferns if you can. Ferns require good drainage, so if your soil is very heavy with clay, it may be necessary to raise the soil level a few inches, or mix in sand to prevent crown rot. 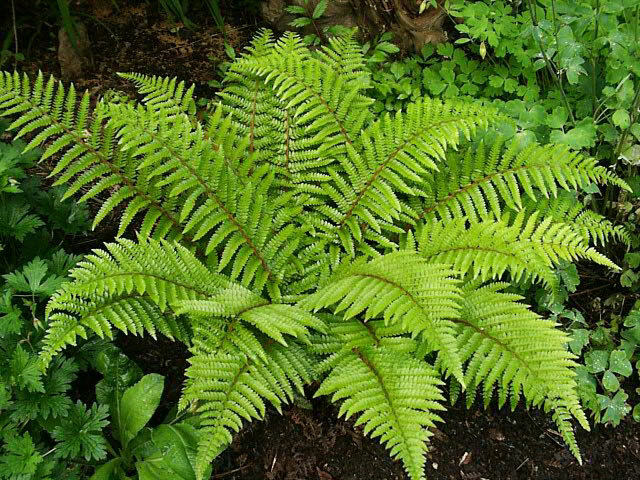 Most hardy ferns grow well in partial shade or indirect sunlight, but there are many of them that will do well in full sun, as long as they get enough water. More than anything else, ferns need both sufficient moisture and good drainage. Whenever possible, water the roots and not the fronds. 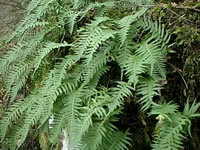 Your ferns will appreciate an annual spring top dressing of chopped up fronds, well rotted-compost or manure. Every 2 or 3 years, you can dig up and divide your ferns into several new plants. 3-5 ft. 5-9 Native to the coastal forests of North America, this large, easy to grow fern grows best when planted in compost rich soil in a cool, shady, moist garden location. Western Sword Ferns are deer resistant and suitable for growing in the acidic soil found beneath Cedar Trees and other conifers. 12-24" 7-9 Deer Ferns can be grown in difficult situations such as under evergreen trees or in deep shade. They are drought tolerate but will grow best if kept damp. Deer Ferns should be planted in a rich acidic (pH 5.0-6.5) soil. They prefer full shade but will grow in almost any light conditions except full sun in a hot climate. 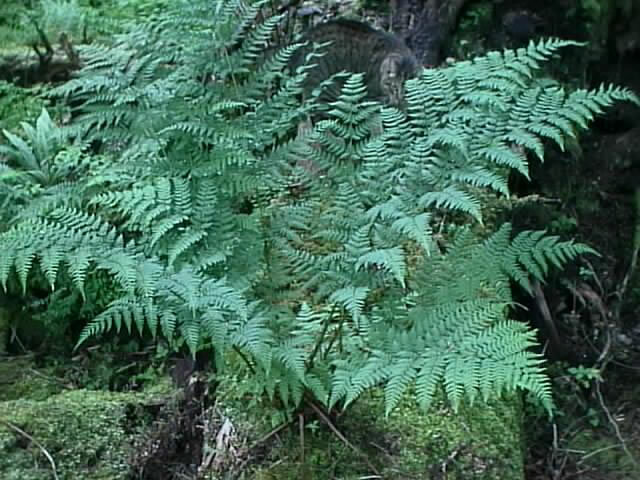 Deer Ferns do not grow well in areas with hot humid summers. 18-24" 4-8 The Coastal Wood Fern is a common native to coastal regions from southern California to British Columbia. 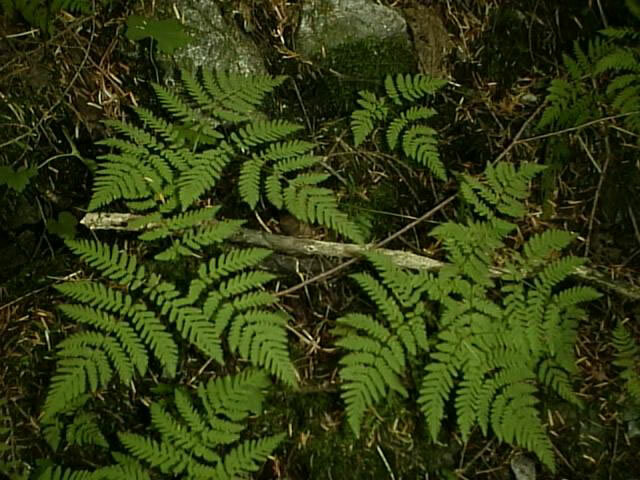 The lacy fronds fan out from thick reddish stems. 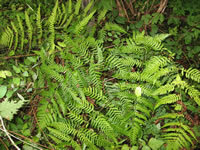 Coastal Wood Ferns can be grown in most average garden soils as long as it is well draining. They grow best in partial or full shade, but can be grown in full sun if they are kept moist. 18-24" 3-8 The Pacific Maidenhair Fern can add a bit of graceful elegance to any partial to fully shaded area of your garden. The fronds emerge in early spring on black, wire-like stems that reach 18-24 inches. Your Pacific Maidenhair should be planted in a rich, humus soil and provided with constant, even moisture. 18-24" 5-8 Tassle Ferns are very showy and easy to grow. Their dark green fronds grow in a very symmetrical, rosette form. The stiff stems are covered with soft, copper-brown hairs. 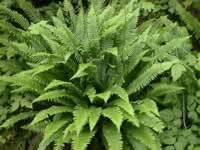 Tassle Ferns should be planted in compost rich, evenly moist soil in a area with partial to full shade. 12-18" 5-9 Licorice Ferns are attractive, epiphytic plants that are primarily found growing with mosses on rotting logs or in Bigleaf Maple trees. They are fairly difficult to grow without a rotting log to plant them in. 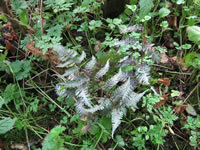 Licorice Ferns grow best partial to full shade, but will tolerate very short periods of bright sun. Generally they require moist soil, but they will tolerate brief periods of drought. 5-12" 3-9 Oak Ferns spread by non-aggressive, underground rhizomes forming a nice delicate looking ground cover in your woodland setting. Oak ferns should be grown in evenly moist, compost rich soil and planted where it will grow in partial to full shade. 15-24" 5-9 The fronds of the Autumn Fern begin to emerge in early spring as a copper to reddish color and mature to dark green by mid summer. In the fall months, Autumn Ferns once again change colors. They should be planted in evenly moist, compost rich soil and grown where they will receive partial to full shade. Autumn Ferns are deciduous in frost zones. 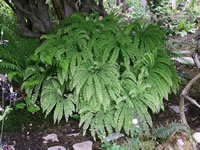 12-15" 4-8 The slow spreading Japanese Painted Fern is probably the most decorative of all ferns. The fronds are tri-colored blends of silver, pink and green, standing above burgundy stems. Japanese Painted Ferns should be grown in full shade to partial shade, where soil is moist but well-drained. 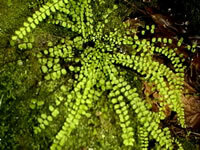 4-7" 3-9 The Maidenhair Spleenwort is a rhizomous, low growing, creeping fern that forms dense tufted rosettes of deep green fronds on black, wire-like stems. 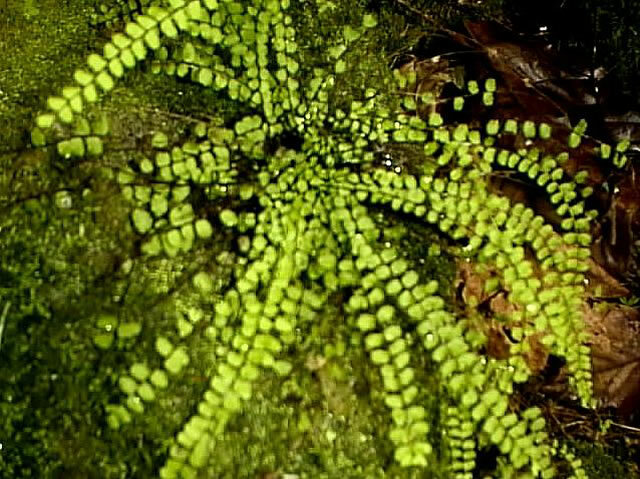 In nature, Maidenhair Spleenworts grow in shady rock cervices and rocky, calcium rich (limestone) soil. They require constant moisture and good drainage. 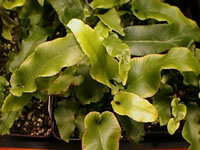 24-30" 6-8 Unlike most other ferns, tropical looking Hart's Tongue Fern has strap-like undivided fronds. 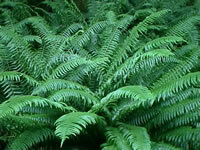 These glossy green ferns are native to most areas of the world with alkaline soil. In areas with acidic soil, you will have to to add lime to the soil before planting. Keep the soil evenly moist. 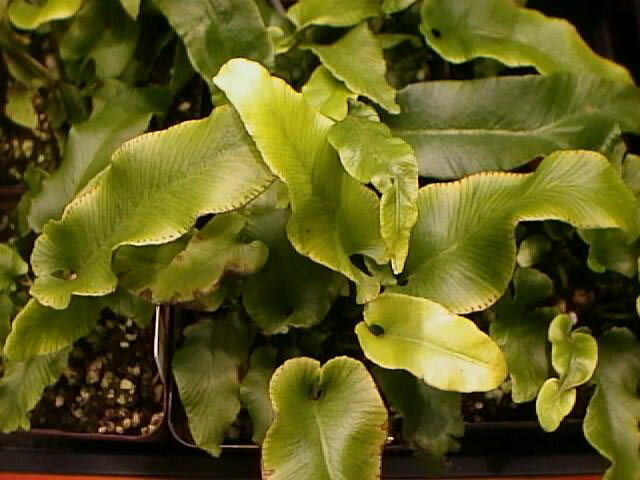 Hart's Tongue Ferns are well suited for growing as a container plant, as long as you add extra lime to the soil mix.